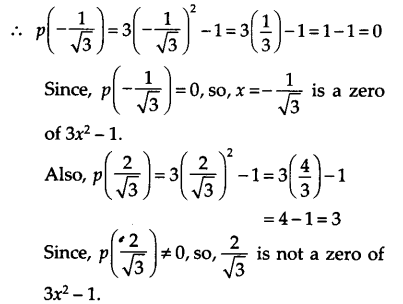 NCERT Solutions for Class 9 Maths Chapter 2 Polynomials Ex 2.1 are part of NCERT Solutions for Class 9 Maths. 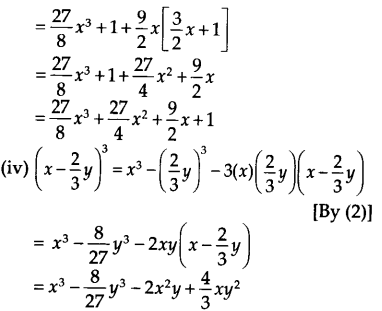 Here we have given NCERT Solutions for Class 9 Maths Chapter 2 Polynomials Ex 2.1. Which of the following expressions are polynomials in one variable and which are not? State reasons for your answer. because each exponent of x is a whole number. because each exponent of y is a whole number. which is not a whole number. Here, exponent of every variable is a whole number, but x10 + y3 + t50 is a polynomial in x, y and t, i.e., in three variables. So, it is not a polynomial in one variable. (i) The given polynomial is 2 + x2 + x. The coefficient of x2 is 1. (ii) The given polynomial is 2 – x2 + x3. The coefficient of x2 is -1. (iv) The given polynomial is √2 x – 1. The coefficient of x2 is 0. Give one example each of a binomial of degree 35, and of a monomial of degree 100. (i) Abmomial of degree 35 can be 3x35 -4. (ii) A monomial of degree 100 can be √2y100. Write the degree of each of the following polynomials. (i) The given polynomial is 5x3 + 4x2 + 7x. The highest power of the variable x is 3. So, the degree of the polynomial is 3.
power of the variable y is 2. So, the degree of the polynomial is 2. (iii) The given polynomial is 5t – √7 . The highest power of variable t is 1. So, the degree of the polynomial is 1. So, the degree of the polynomial is 0. Classify the following as linear, quadratic and cubic polynomials. (i) The degree of x2 + x is 2. So, it is a quadratic polynomial. (ii) The degree of x – x3 is 3. So, it is a cubic polynomial. (iii) The degree of y + y2 + 4 is 2. So, it is a quadratic polynomial. (iv) The degree of 1 + x is 1. So, it is a linear polynomial. (v) The degree of 3t is 1. So, it is a linear polynomial. (vi) The degree of r2 is 2. So, it is a quadratic polynomial. (vii) The degree of 7x3 is 3. So, it is a cubic polynomial. Thus, the value of 5x – 4x2 + 3 at x = 0 is 3. Thus, the value of 5x – 4x2 + 3 at x = -1 is -6. Thus, the value of 5x – 4x2 + 3 at x = 2 is – 3. Find p (0), p (1) and p (2) for each of the following polynomials. (i) Given that p(y) = y2 – y + 1. Verify whether the following are zeroes of the polynomial, indicated against them. Since, p(1) = 0, so x = 1 is a zero of x2 -1. Since p(-1) = 0, so, x = -1, is also a zero of x2 – 1. Since, p(-1) = 0, so, x = -1 is a zero of (x + 1)(x – 2). Since, p(2) = 0, so, x = 2 is also a zero of (x + 1)(x – 2). Since, p(0) = 0, so, x = 0 is a zero of x2. is not a zero of 2x + 1. (vii) p (x) = cx + d, c ≠ 0 where c and d are real numbers. Thus, zero of x + 5 is -5. (ii) We have, p(x) = x – 5. Thus, zero of x – 5 is 5. Thus, zero of 3x is 0. (vi) We have, p(x) = ax, a ≠ 0. Thus, zero of ax is 0. (i) The zero of x + 1 is -1. (iii) The zero of x is 0. Thus, the required remainder = 1. (iv) The zero of x + π is -π. Thus, the required remainder is -π3 + 3π2 – 3π+1. Find the remainder when x3 – ax2 + 6x – a is divided by x – a. We have, p(x) = x3 – ax2 + 6x – a and zero of x – a is a. Thus, the required remainder is 5a. Check whether 7 + 3x is a factor of 3x3+7x. i.e. the remainder is not 0. ∴ 3x3 + 7x is not divisib1e by 7 + 3x. Thus, 7 + 3x is not a factor of 3x3 + 7x. 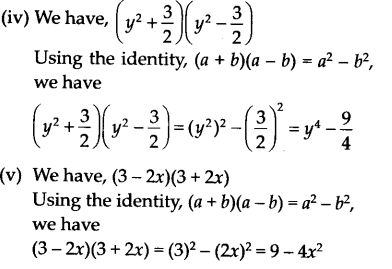 Determine which of the following polynomials has (x +1) a factor. The zero of x + 1 is -1. ∴ p (-1) = (-1)3 + (-1)2 + (-1) + 1 . So, (x+ 1) is a factor of x3 + x2 + x + 1. So, (x + 1) is not a factor of x4 + x3 + x2 + x+ 1. (iii) Let p (x) = x4 + 3x3 + 3x2 + x + 1 . So, (x + 1) is not a factor of x4 + 3x3 + 3x2 + x+ 1. So, (x + 1) is not a factor of x3 – x2 – (2 + √2) x + √2. ⇒ p(-1) = 0, so g(x) is a factor of p(x). ⇒ p(-2) ≠ 0, so g(x) is not a factor of p(x). ⇒ p(3) = 0, so g(x) is a factor of p(x). For (x – 1) to be a factor of p(x), p(1) should be equal to 0. (x+ a) (x+ b) = x2 + (a + b) x+ ab. Factorise 27x3 +y3 +z3 -9xyz. = x3 + y3 + z3 – 3xyz = L.H.S. If x + y + z = 0, show that x3 + y3 + z3 = 3 xyz. Let x = -12, y = 7 and z = 5. Let x = 28, y = -15 and z = -13. Thus, the possible length and breadth are (5a – 3) and (5a – 4). Thus, the possible length and breadth are (7y – 3) and (5y + 4). What are the possible expressions for the dimensions of the cuboids whose volumes are given below? ∴ The possible dimensions of the cuboid are 3, x and (x – 4). Thus, the possible dimensions of the cuboid are 4k, (3y + 5) and (y -1). 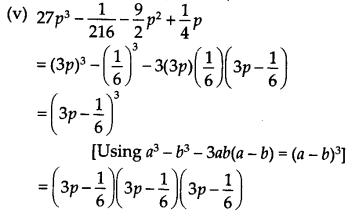 We hope the NCERT Solutions for Class 9 Maths Chapter 2 Polynomials Ex 2.1, help you. If you have any query regarding NCERT Solutions for Class 9 Maths Chapter 2 Polynomials Ex 2.1, drop a comment below and we will get back to you at the earliest.